Perfecky Pro is a great Wordpress plugin for various general requirements of each wordpress websites.Perfecky Pro provide bundle of features to make it perfect Perfecky Pro.Multiple plugins slow down website,Perfecky Pro will get rid you from this problem.Perfecky Pro helps you to handle Email Marketing, SMS Marketing, Testimonials, Sliders, Countdown Timer, Maintenance Mode, Social Profile Buttons, Rating & Reviews, Login Security & Appearance, Admin Bar Security & Appearnance, Analytics & much more we adding.Manage all your required settings at one place and make your website smooth.Perfecky Pro will boost your bussiness with its features.Amazing hmm!! :).Let's look into all the features of Perfecky Pro. 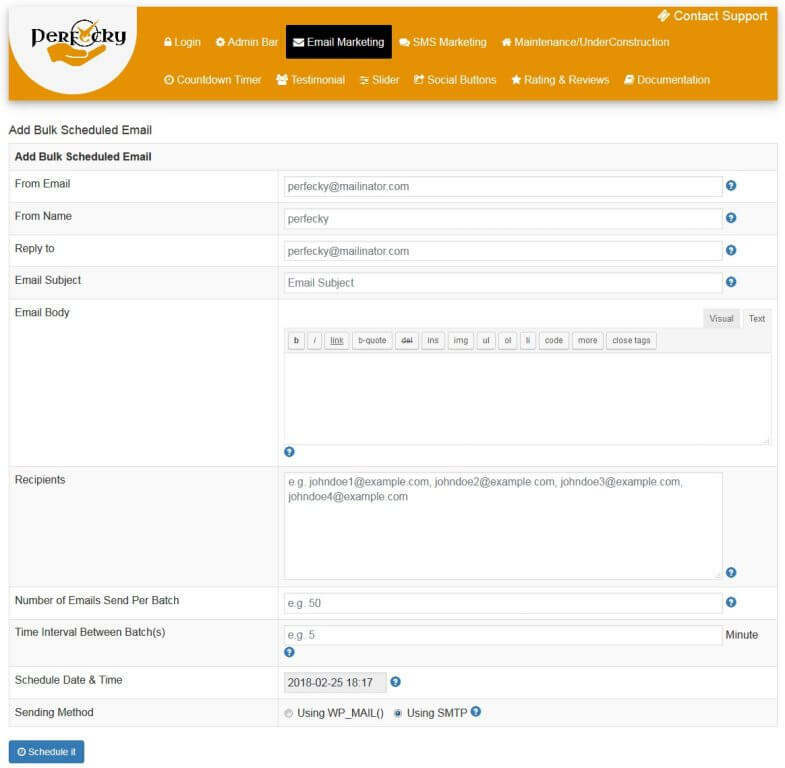 Perfecky Pro provide great feature for email marketing.You can enable/disable email marketing on single click.Perfecky Pro offer ability to send bulk/single email sending.Yes,you can also schedule email(s).You can send email(s) for third party email sending services and using server mail function as well.Fully manageable email templates.Let look into various features of Perfecky Pro email marketing. 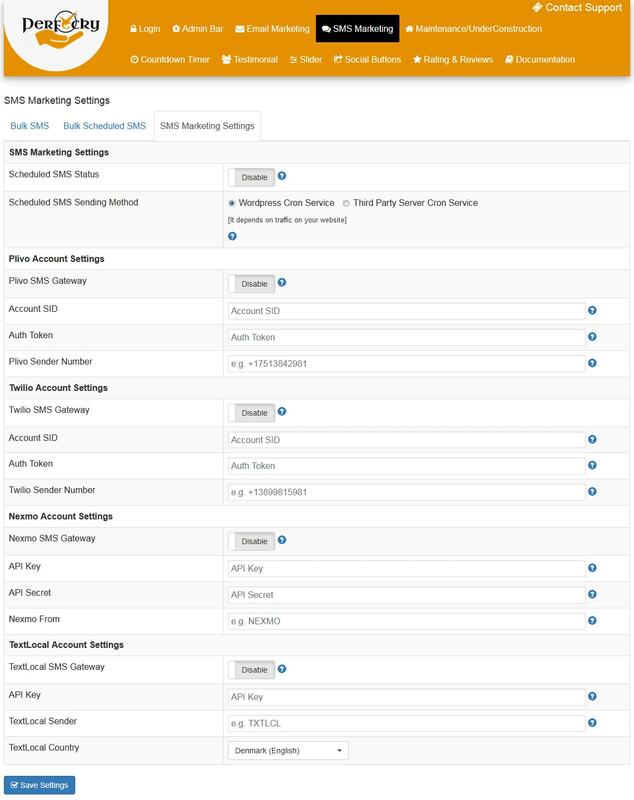 With this option you can quickly send email to single/bulk user by just filling simple inputs. 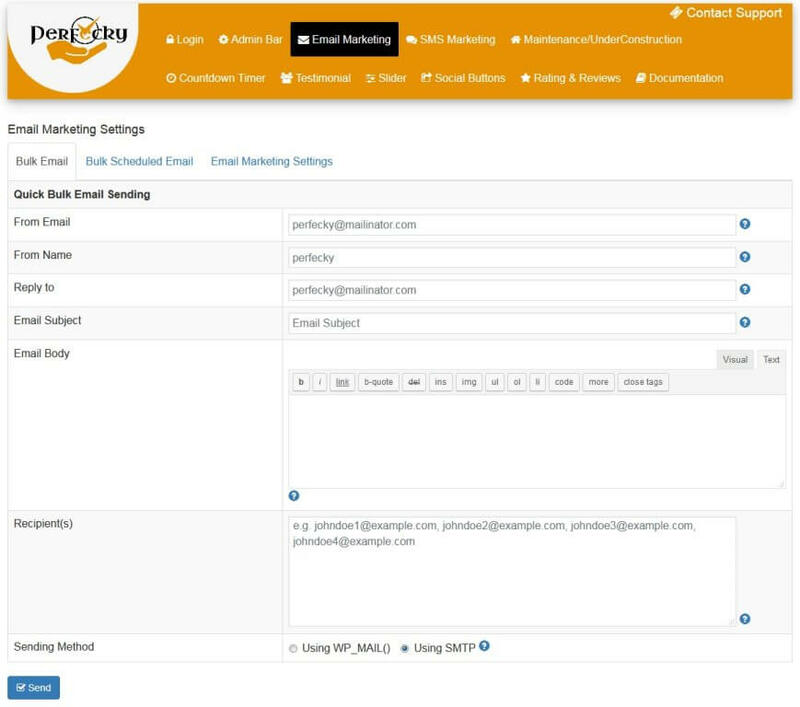 With this option you can create scheduled email for send to single/bulk user by fill simple inputs. #.Scheduled Email Status-: With this option you can enable/disable scheduled emails on single click. #.SMTP Host Name-SMTP connection hostname of your third party SMTP service. #.SMTP Authentication-: SMTP authentication option based on your third party SMTP server. #.Encryption Type-: Encryption type of your third party SMTP server. 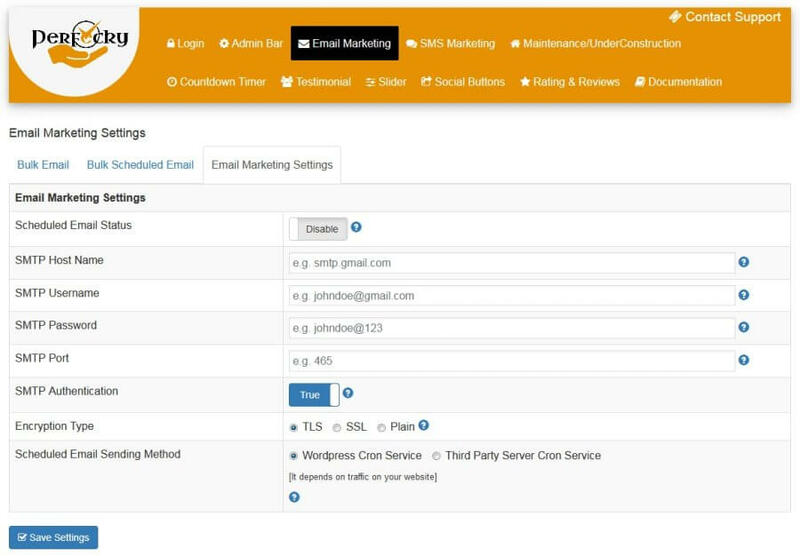 #.Scheduled Email Sending Method-:Methods to trigger scheduled emails-:1).Third party server based cron to trigger scheduled emails.2).WP Cron service to send scheduled email using website trafic. Perfecky Pro provide great feature for sms marketing.You can enable/disable sms marketing on single click.Perfecky Pro offer ability to send bulk/single sms sending.Yes,you can also schedule sms(s).You can send sms(s) with Twilio, Plivo, Nexmo & TextLocal sms sending services.Fully manageable sms templates.Lets look into various features of Perfecky Pro sms marketing. With this option you can quickly send sms to single/bulk user by just filling simple inputs. 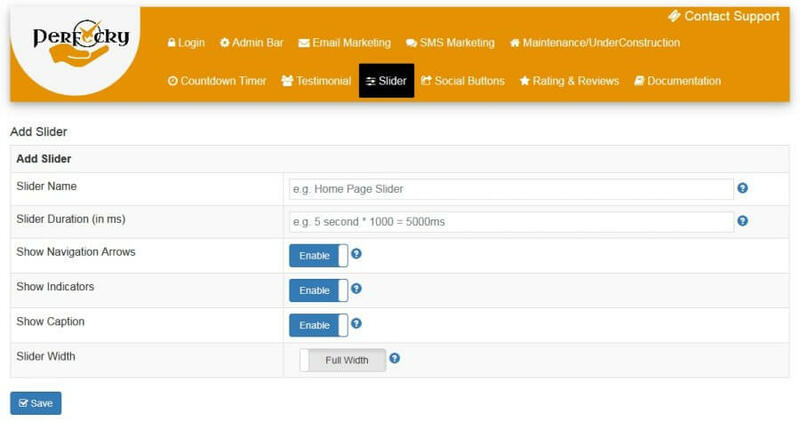 With this option you can create scheduled sms for send to single/bulk user by fill simple inputs. #.Scheduled SMS Status-: With this option you can enable/disable scheduled SMS on single click. 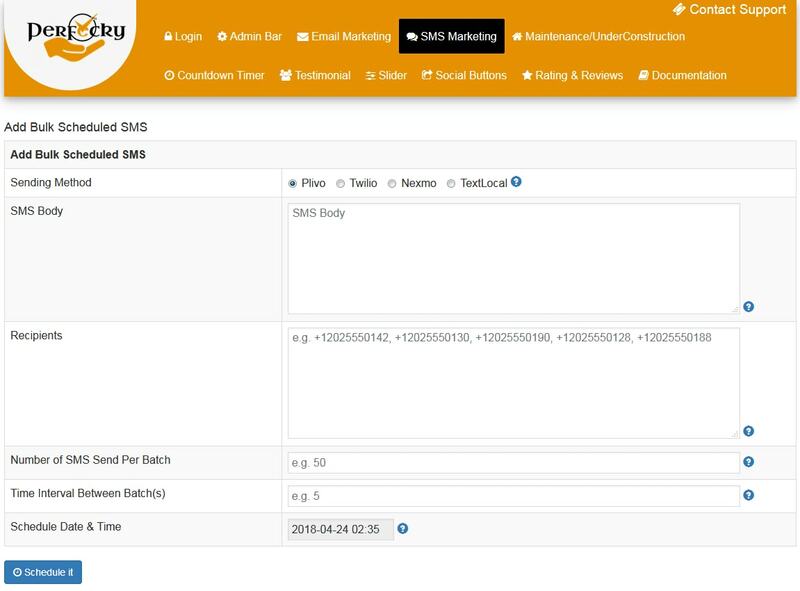 #.Scheduled SMS Sending Method-:Methods to trigger scheduled sms-:1).Third party server based cron to trigger scheduled sms.2).WP Cron service to send scheduled sms using website trafic. #.Account SID-:Account SID of Plivo SMS gateway credentials. #.Auth Token-:Auth Token of plivo SMS gateway credentials. 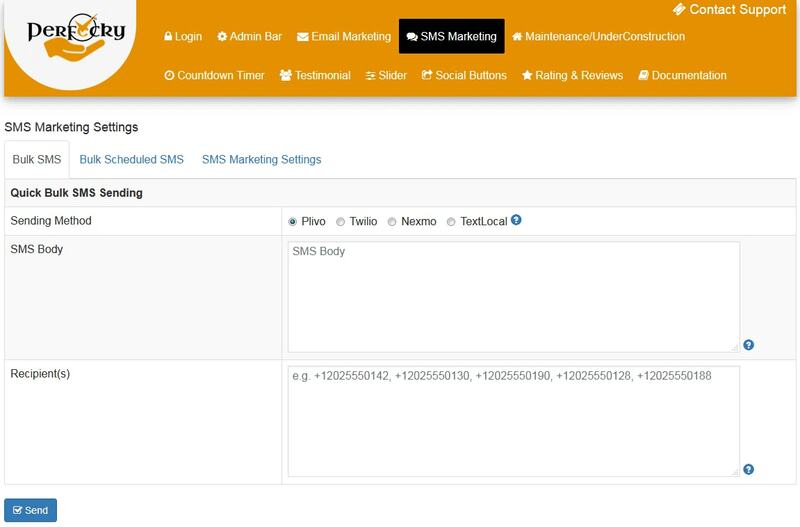 #.Plivo Sender Number-:Sender number of plivo sms gateway method. #.Account SID-:Account SID of Twilio SMS gateway credentials. #.Auth Token-:Auth Token of Twilio SMS gateway credentials. #.Twilio Sender Number-:Sender number of Twilio sms gateway method. #.API Key-:API Key of Nexmo SMS gateway credentials. #.API Secret-:API Secret of Nexmo SMS gateway credentials. #.Nexmo From-:From name of Nexmo sms gateway method. #.API Key-:API Key of TextLocal SMS gateway credentials. #.TextLocal Sender-:TextLocal Sender name of TextLocal SMS gateway credentials. #.TextLocal Country-:Your Country to send message of TextLocal sms gateway method. Perfecky Pro provide great feature to manage your wordpress login.Manage from both views security and appearance.You can manage security with captcha and login limits using Perfecky Pro.You can also fully manage appearance of your wordpress login page.Lets look into more options of Wordpress login in Perfecky Pro. 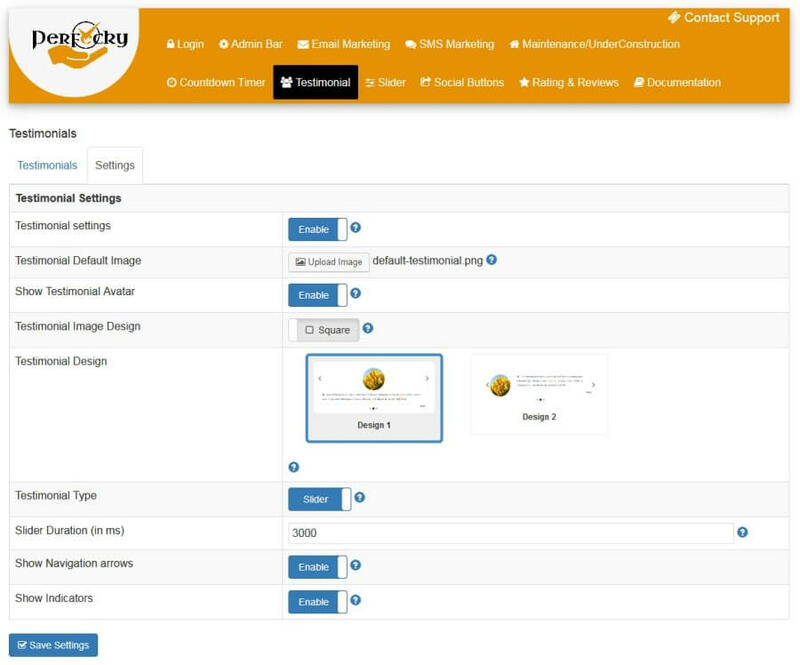 #.Login Appearance Settings-: With this option you can enable/disable login appearance settings of Perfecky Pro on single click. #.After Login Redirect To-:With this option you can set redirect url for user to redierct after sucessfull login. #.Login Page Background Type-: With this option you can set login page background as image or background color. #.Login Page Bakcground Color-: With this option you can background color of your login page. #.Login Page Bakcground Image-:With this option you can manage background image of your login page. #.Login Form Text Color-: With this option you can manage the color of your login form text. #.Login Form Error Message Text Color-:With this option you can manage the color of your login page error message text. #.Login Form Error Message Left Border Color-: With this option you can manage left broder color of your wordpress login page error message. #.Login Form Background Type-: With this option you can manage background of your wordpress login form as background image or background color. #.Login Form Background Image-: With this option you can set background image of your wordpress login form. 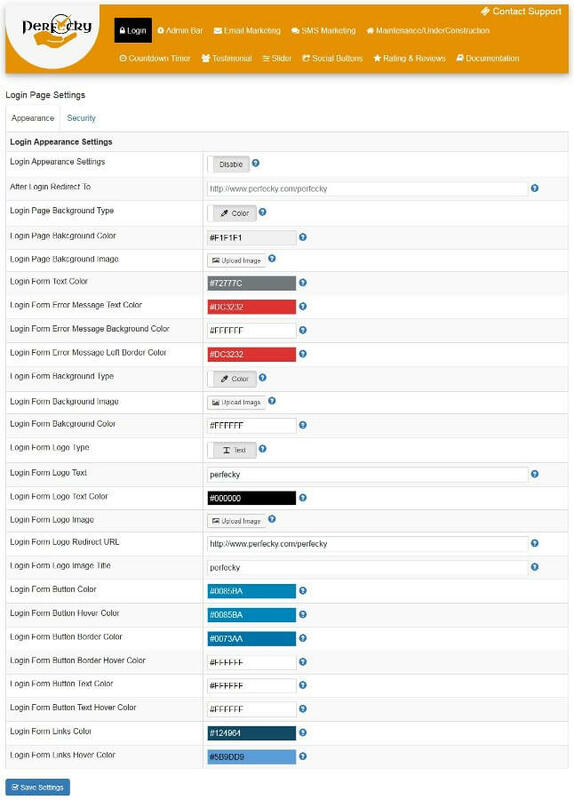 #.Login Form Bakcground Color-: With this option you can set background color of your wordpress login form. #.Login Form Logo Type-: With this option you can set wordpress login logo as Text or image. #.Login Form Logo Text-: With this option you can set custom text as logo of login form. #.Login Form Logo Text Color-: With this option you can manage the color of your login form text logo. #.Login Form Logo Image-: With this option you can upload logo image for your login form logo. #.Login Form Logo Redirect URL-:With this option you can set URL of your login form logo. #.Login Form Logo Image Title-:With this option you can set title tag of your login form logo image. #.Login Form Button Color-:With this option you can manage color of your login form button. #.Login Form Button Hover Color-: With this option you can manage hover color of your login form button. #.Login Form Button Border Color-: With this option you can manage border color of your login form button. #.Login Form Button Border Hover Color-:With this option you can manage on hover border color of your login form button. #.Login Form Button Text Color-:With this option you can manage color of your login form button text. #.Login Form Button Text Hover Color-:With this option you can manage hover color of your login button text. #.Login Form Links Color-: With this option you can manage other link color of your login form like forgot password url etc. #.Login Form Links Hover Color-:With this option you can manage other link hover color of your login form like forgot password url etc. #.Login Security Settings-: With this option you can enable/disable login security settings of Perfecky Pro on single click. #.Number of login attempts-:With this option you can set number of login attempts for login. #.Lockout Duration-:Lockout duration is to allow user to login again after failed attempts after selected time duration. #.Login Form Captcha-:With this option you can enable captcha on your wordpress login form. #.Captcha Error Message-:With this option you can set error message when user enter invalid captcha value. #.Login Attempt Error Message-:With this option you can set login attempts error message when you reach maximum login attempts limit. Perfecky Pro provide various options to manage your admin bar of wordpres website.You can manage appearance and security of your wordpres admin bar.Lets look into various options of admin bar in Perfecky Pro. #.Admin Bar Appearance Settings-: With this option you can enable/disable admin bar appearance settings of Perfecky Pro on single click. #.Admin Bar Bakcground Color-:With this option you can set background color of your admin bar. #.Admin Bar Link Color-:With this option you can set link color of your admin bar. #.Admin Bar Link Hover Color-:With this option you can manage hover color of your admin bar links. 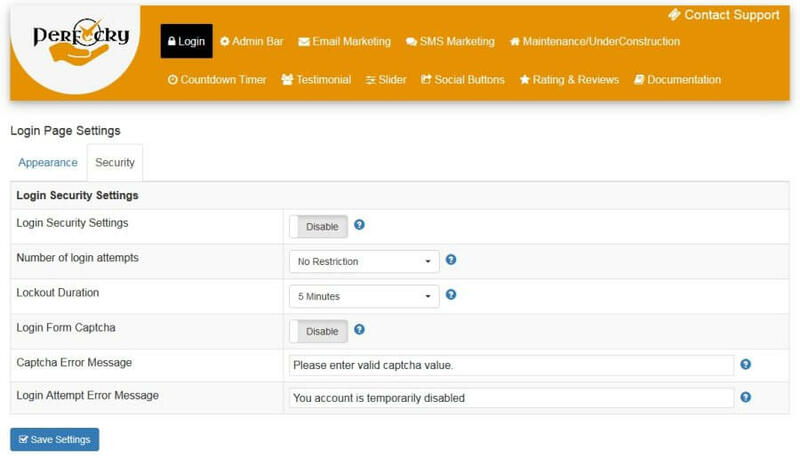 #.Show admin bar-: With this option you can enable/disable admin bar on your wordpress website. #.Pages Restriction-:With this option you can hide wordpres admin bar on selected pages. #.Category Restriction-:With this option you can hide admin bar on selected categories. #.User Role Restriction-: With this option you can hide admin bar for selected role users. 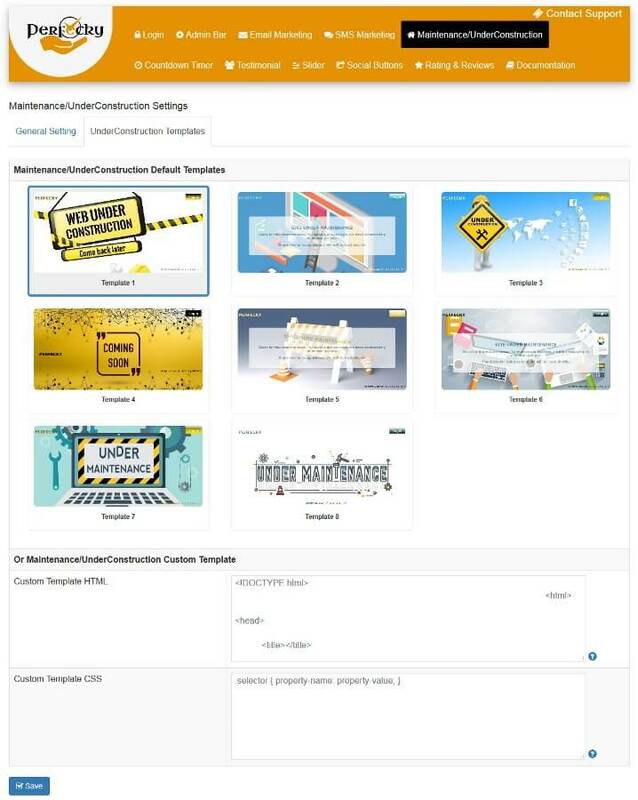 Perfecky Pro provide various options to set Maintenance/UnderConstruction mode on your wordpress website.Perfecky Pro provide option of 8 inbuilt Maintenance/UnderConstruction templates.Perfecky Pro also provide option to set your own html/css to design your Maintenance/UnderConstruction page of your website.Lets look into various options of Maintenance/UnderConstruction in Perfecky Pro. #.Under Construction Mode-: With this option you can enable/disable Under Construction Mode of Perfecky Pro on single click. #.Under Construction Template Type-:With this option you can set template type as default/custom. #.Automatic End Date & Time-:With this option you can end date and time of Maintenance/UnderConstruction mode. 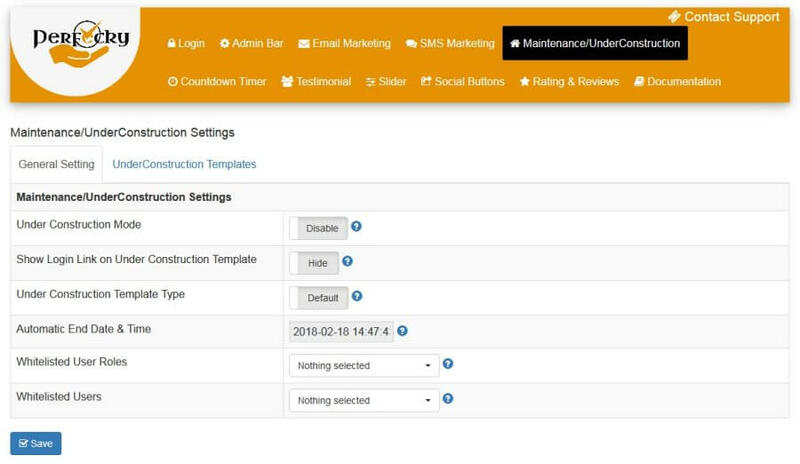 #.Maintenance/UnderConstruction Default Templates-: With this option you can choose template of your Maintenance/UnderConstruction mode from default templates of Perfecky Pro. #.Custom Template HTML:With this option you can HTML of your custom template. #.Custom Template CSS-:With this option you can set CSS to style your custom HTML. Perfecky Pro provide feature to add/edit/delete unlimited countdown timers in your website.You can set option to show custom text after countdown time end.You can also set image to show after countdown timer end.You can display countdown timers with shortcode like [pfpro_countdown_timer id=1] .Lets look into various options of Countdown timer in Perfecky Pro. 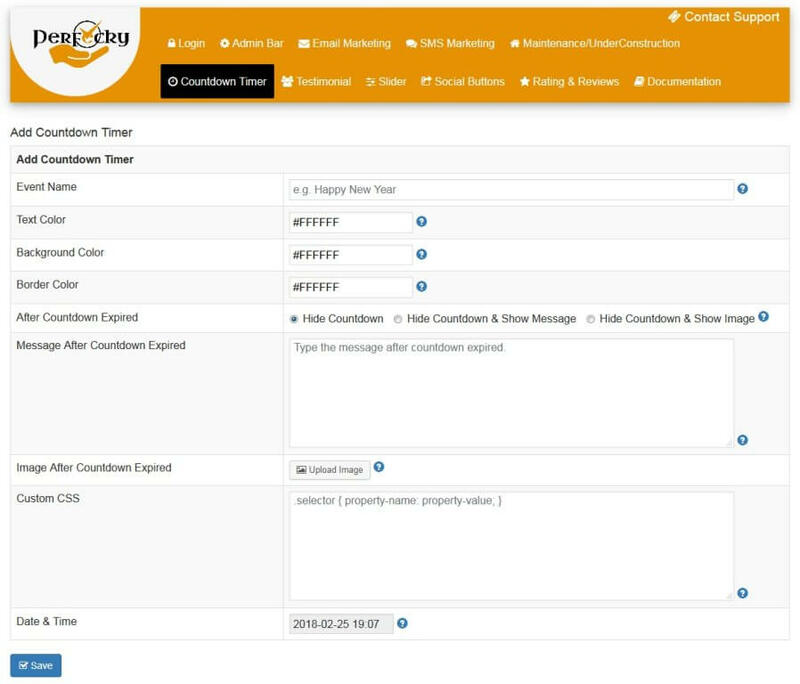 Global Countdown Timer Mode-: Option to enable/disable all countdown timers of Perfecky Pro. #.Event Name-: With this option you can set event name for your countdown timer. #.Text Color-:With this option you can set text color of your countdown timer. #.Background Color-:With this option you can set background color of your countdown timer text. #.Border Color-: With this option you can set border color of you countdown timer text. #.After Countdown Expired-:With this option you can set what to show after countdown timer end-Nothing,Image,Text. #.Message After Countdown Expired-:With this option you can set your custom message to show after Countdown timer end. #.Image After Countdown Expired-:With this option you can set your custom image to show after Countdown timer end. #.Custom CSS-:With this option you can add custom CSS to style you countdown timer. #.Date & Time-: With this option you can set end Date & Time of countdown timer. 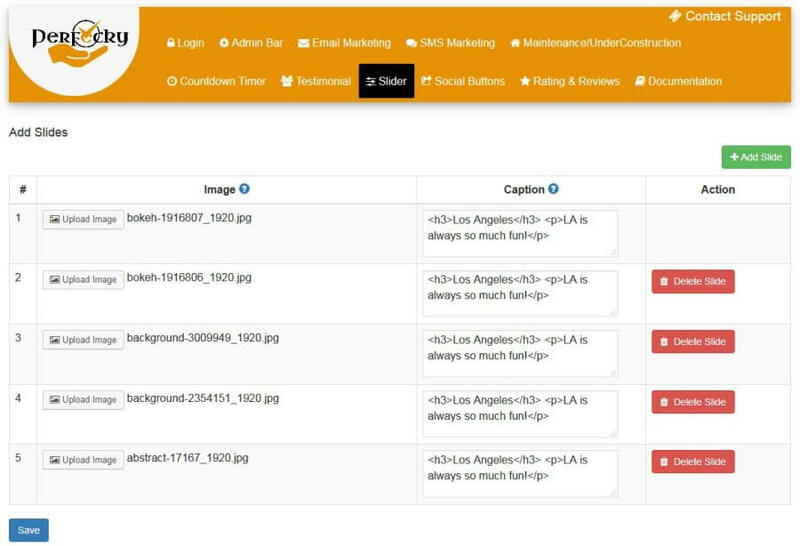 Perfecky Pro provide feature to manage your testimonials.You can display your testimonials on your website with shortcode [pfpro_testimonial] . 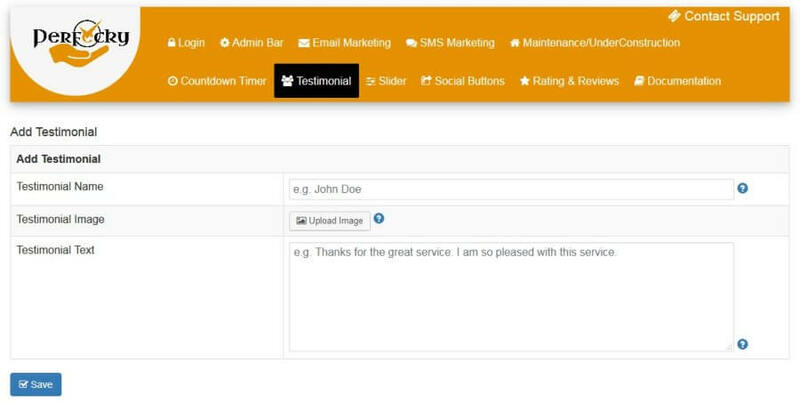 #.Testimonial Name-:Input field to add Testimonial client name. #.Testimonial Image-:Image of your testimonials client. #.Testimonial Text-:Testimonial text of your client. #.Testimonial settings-:With this option you can enable/disable testimonials to show on your website with just single click. #.Testimonial Default Image-:With this option you can default image of testimonials client. #.Show Testimonial Avatar-:With this option you can enable/disable testimonials avator. #.Testimonial Type-:With this option you can show your testimonials as slider or listing. #.Show Navigation arrows-:With this option you can enable/disable navigation arrows on your testimonial slider. Perfecky Pro provide feature to display unlimited slider on your website.You can display slider with shortcode like [pfpro_slider id=1] .You can create unlimited slides in slider.You can also manage your slider options as well.Lets look into various slider options in Perfecky Pro. #.Slider settings-: With this option you can enable/disable all the sliders of Perfecky Pro on single click. #.Slider Name-:This is the name of your slider. #.Show Navigation Arrows-:With this option you can enable/disable navigation arrows on your slider. #.Show Indicators-:With this option you can enable/disable slider indicators. #.Show Caption-:With this option you can show caption on your slider. #.Slider Width-:With this option you can manage width of slider,full width also you can set custom height,width as well. #.Image-:You can upload any image in slider. #.Caption-:You can set caption on slide image. Perfecky Pro provide feature to manage social button to manage on your website.Perfecky Pro provide 22+ inbuilt social buttons which you can set on your website.Perfecky Pro also provide option you set custom icon for your social button which suite with your site color scheme.Perfecky Pro provide inbuilt default icon for 22+ social buttons.You can display social button on your website with shortcode [pfpro_social_buttons] .Lets look into more options under social button in Perfecky Pro. #.Button URL-:You can set URL of your social button for inbuilt Perfecky Pro social buttons. #. Custom Icon-: You can upload custom icon for your social button. #.Icon Type-: With this option you can change type of your social button on single click.You can set Custom/default icon type for Perfecky Pro inbuilt buttons. #.Social Button Status-:You can enable/disable display of your social buttons with one click. 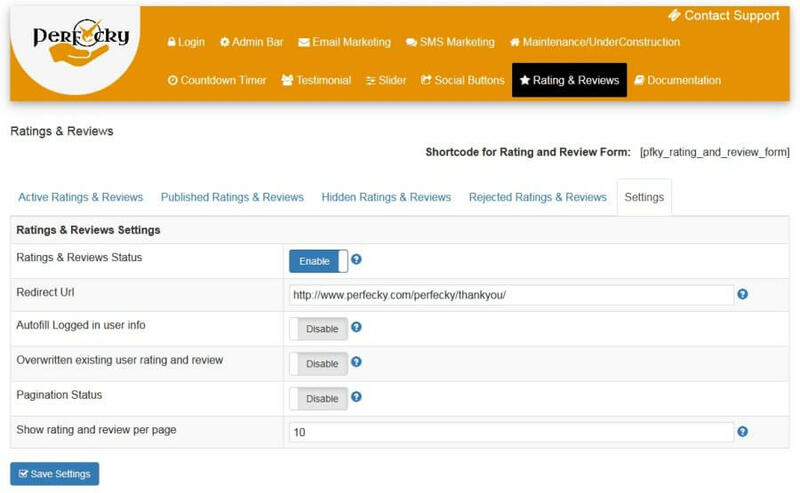 Perfecky Pro provide feature to collect rating & reviews from clients.You can also publish your rating & reviews on your website as well.You can control all your rating & reviews from admin pannel.You can collect your rating & reviews with smooth ajax based rating & reviews collection form.You can publish verified rating & reviews with shortcode [pfpro_ratings_and_reviews_list] .You can add rating & reviews collection form with shortcode [pfpro_rating_and_review_form] .Lets look into more options in ratings & reviews feature of Perfecky Pro. In this tab you will get all the latest submitted ratings & reviews by users.You can change the status of these ratings & reviews to Publish,Hidden,Reject. In this tab you will get all the publish status ratings & reviews by users.You can change the status of these ratings & reviews to Hidden,Reject,Delete. In this tab you will get all the hidden status ratings & reviews by users.You can change the status of these ratings & reviews to Publish,Reject,Delete. In this tab you will get all the reject status ratings & reviews by users.You can change the status of these ratings & reviews to Publish,hidden,Delete. #.Ratings & Reviews Status-: With this option you can enable/disable ratings & reviews feature of Perfecky Pro. #.Ratings & Reviews Status-: With this option you enable/disable ratings & reviews feature of Perfecky Pro. #.Redirect Url-: With this option you can set URL for user to redierct after submit sucessfull rating & review.Like thankyou page URL. #.Autofill Logged in user info-: If this option is enable it will auto fill logged in user name email in rating & review form to make easy for user. #.Overwritten existing user rating and review-:If this option is enable,it will overwrite the existing review of the same email user.if it is disable it will add new review each time when user add. #.Pagination Status-: If you want to show pagination in listing of your ratings & reviews you can enable it. #.Show rating and review per page-: With this option you can set number of rating & reviews limit to show on per page. To make it easy for you , we create analytics for you. 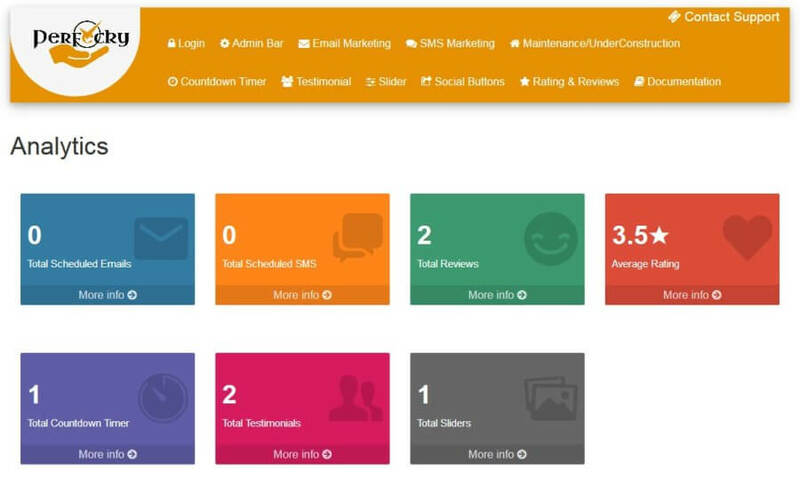 Analytics will help you to get all the feature usage and enteries. Thanks for reading documentation and your love to Perfecky Pro. We are working on more feature to make it super Perfecky Pro for you. If still facing any issue, please feel free to contact us at contact.perfecky@gmail.com . We are always here to help you. You can also write for new feature and for improvement as well. We always need you suggestions for Perfecky Pro. © Copyright Perfecky Pro. All Rights Reserved.